After starting their title challenge in the worst possible way, a hole in their hull after a simple collision on the first day, Spain’s Iker Martinez and Tara Pacheco finished off a long, difficult regatta La Grande Motte, France when they collected their first major title as a partnership by clearly winning the sudden death, tricky light winds medal race to secure the Nacra 17 European Championship. Representing a first success in the new Olympic chapter of the storied, supremely diverse career of the helm from Hondaribbia in Spain’s Basque country, and the former 470 champion Pacheco, the duo actually built the firm foundations of their success on Friday when they scored three back to back second places when all their main rivals failed to come close in terms of that level of consistency in strong wind conditions. In today’s medal race the Italian duo Vittorio Bissario and Silvia Sicouri had to win with the Spanish pair in eighth if they were to be overturned. But it was the wily Martinez and Pacheco who sneaked off the start line in the very light, fickle breeze and got into the biggest and best puff first. They lead Britain’s Olympic gold medallist Pippa Wilson and John Gimson around the windward mark on the first round. France’s World Champions Billy Besson and Marie Riou rallied after a poor start and took the lead momentarily on the second of three windward legs, but with the wind making a big shift to the right the Spanish had regained the lead at the top of the final round, finishing comfortably ahead of Besson and Riou. At one stage the Italians were deep enough in the ten boat fleet that it looked like second overall might go to the French – who had lead until yesterday when they capsized and had to count a 27th in their final aggregate – but Bissario and Sicouri held their nerve and finish second with Besson and Riou content to have salvaged third. “For sure we are very good where we are now, but the truth is this was a very special regatta with only one real set of conditions – pretty windy – and the medal race today was a little bit tricky, so it probably does not show exactly where every one is in terms of looking towards the World Championships.” Martinez ventured today. 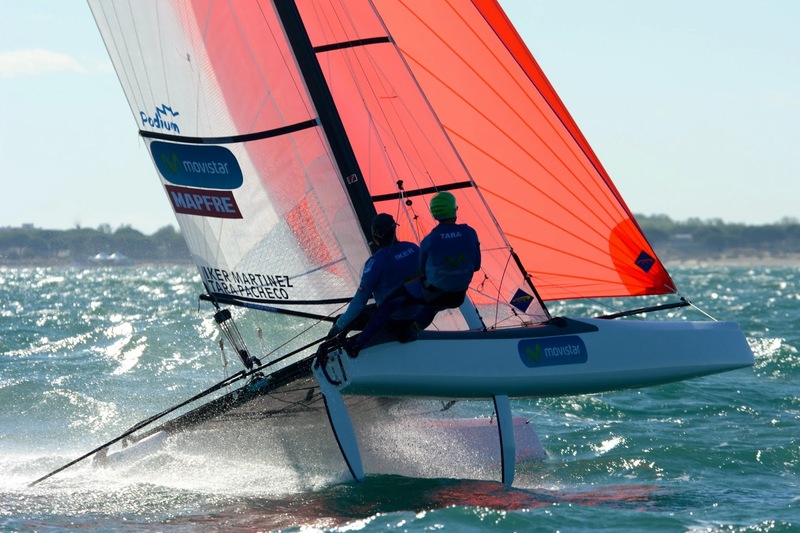 La Grande Motte delivered mainly strong winds, even if the first day of racing was lost to a lack of breeze. And one full day was missed because of breezes which were too strong. That meant just three Finals races were sailed. The French duo’s one aberration sullied an otherwise excellent performance which would otherwise have one them the title. The cruel irony is that when they capsized in Friday’s third race, they were sailing super conservatively with Besson off the wire and on the trampoline, holding third place. Their boat stalled in the back of a wave, the ebullient French helm was washed off the boat but for his leg and they capsized when he lost control of the helm. Iker Martinez (ESP) European champion with Tara Pacheco: “It means we are improving, slowly. We are improving and that is good news. We have done quite a lot of training but really not as much as we would have liked to do. It is not just a new class but Tara and myself are a new team together with a new coach. Santi Lopez is coaching us we had a long years of fighting for selection with him so it is nice to have him on our side now. He was the head coach for London for the team and now he is coaching us so we are very lucky to have someone with so much experience. We were mainly in Santander training but went to Morocco with the French guys and we travelled a lot. It all helps. Every day helps, we find new problems every day and we solve them and move one step forwards. For sure we are very good where we are now, but the truth is this was a very special regatta with only one real set of conditions – pretty windy – and the medal race today was a little bit tricky, so it probably does not show exactly where every one is in terms of looking towards the World Championships. I think the guys like Billy Besson and the Italians – I don’t want to say they are unbeatable – but we have to catch up with them. I think they have catamaran knowledge and obviously they are fast. That is where they have the advantage. They always have the boat well set up. We have to learn how to always have the boat well prepared and well set up and all these things. So still we are sometimes good, sometimes bad, sometimes good. Yesterday was great we were on the limit and it was very shifty and that was good for us. We did not have any major things. Vittorio Bissario (ITA) 2nd overall: “We are happy to have held on to second place and on a day like today we are happy to have done that. It was not easy. It was really complicated. We know that in these conditions that luck can play a big part and so we are happy in our ability today. Now to relax. We need to take some time to relax and have a week off. Then we sail for one week on Garda and them move to Santander at the beginning of August to train there. Here we feel complete. We are not maybe the best at starting, or the fastest, but all in all I think we are a complete team and I think that is why we can be always there, always regular. We never think of who we are sailing against. They are other boats to sail against not people far less people with Olympic medals. We just try to beat them all.